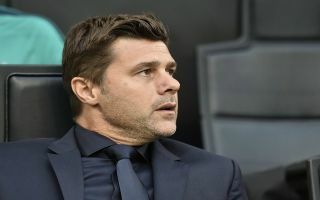 Mauricio Pochettino launched an angry defence of his Tottenham players after a disappointing loss at the San Siro in the Champions League on Tuesday. Spurs kicked off their latest European campaign last night in Italy against Inter Milan, ultimately succumbing to a 2-1 defeat despite dominating the game for large periods. Pochettino’s men squandered a few good chances in the first half before opening the scoring on 53 minutes, courtesy of a deflected Christian Eriksen strike. From then on the Lily Whites continued to dictate the pace of the game, until a nightmare ten minute period at the end of the match. Mauro Icardi scored a wonderful equaliser on 85 minutes, before Matias Vecino headed home the winning goal in stoppage time, to condemn Spurs to their third consecutive defeat in all competitions. The Argentine boss was in no mood to criticise his players post-match, however, as he embarked on a foul-mouthed rant when asked about the absence of Kieran Tripper and Toby Alderwiereld, both of whom were left out of the final squad for the game – as per Sky Sports. “(It’s) easy to talk about the players that aren’t here,” said Pochettino. “I think we need to talk about football. Because, you know I think you force me to say something that is not good. You disrespect the players that today showed better qualities than the opponent. “Why disrespect the players that aren’t on the pitch? You can blame me and say, ‘Gaffer, you were so, so rubbish in your selection of the starting XI’. “But please don’t disrespect the players who were playing, because it’s my decision. Kieran Trippier, Toby Alderweireld… we have 25 players. “And you believe that and sometimes you behave like you ask me with your question, that you can play only 11 and the other 13 or 14 players are rubbish, are s**t.
The pressure seems to be getting to the 46-year-old tactician in the wake of the club’s latest defeat, as the early praise for Tottenham’s winning start in the Premier League has quickly been replaced with negativity and criticism in the media. Next up for Spurs is a trip to the South Coast on Saturday to face Brighton, which is now a must-win game for the club to halt their slide and re-affirm their status as contenders for a place in the top four in the Premier League.